I like to enjoy this meal after a long day when I've returned from a workout, it is the perfect ratio of complex carbohydrates, little fat, and protein. The chicken takes the longest so remove the skin from the drumsticks, put in a foil lined deep baking tray with a splash of olive oil, thyme, rosemary, and black pepper. Roll the meat in the seasoning and pop in the oven at 170 degrees (between gas mark 3-4), for 40 minutes. Peel the sweet potato - this can be tricky compared to normal potatoes so take your time. Put a pint of cold water in a pan and get it boiling. Chop the potatoes and add to the boiling water. Turn to a medium heat once it gets boiling again and cover for 10 minutes. After 10 minutes the potatoes should be 'popping' the lid of the saucepan off almost. The potato should have softened somewhat. Drain the water and take the chicken out the oven. Add the sweet potato chunks and roll in the oily bottom of the tray. Squeeze the lime and orange and put back in the oven for 20 minutes. While it's cooking assemble the veg in the following order: Spinach, alfalfa sprouts, crumbled goats cheese. Once the chicken and potatoes are cooked top the dish with the chicken drumsticks then put the chunks of sweet potato around. 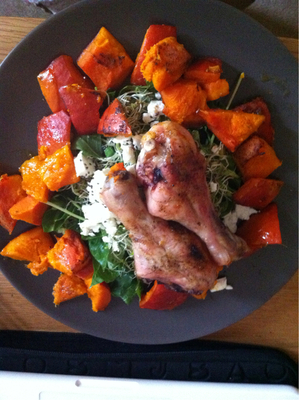 Dig in - the sweet potato is meltingly good, the chicken is tender and juicer, and the vegetables fresh flavours compliment the herby flavours.